Home » Interior Decor » Decorate as You Dress! Overcast Grey! Decorate as You Dress! Overcast Grey! The weather has been so dreary lately that I decided to wear a grey dress to a social function yesterday to match the weather. Now don’t get me wrong, I love the colour grey and love using it in home decor….I just wish that in the middle of May I wasn’t wearing grey. Oh well. The walls of this eating nook speak overcast skies, while the silvery grey chairs shout glam!! Add some animal skin and grey hardwood floors and I would definitely hang out here on a rainy day!! 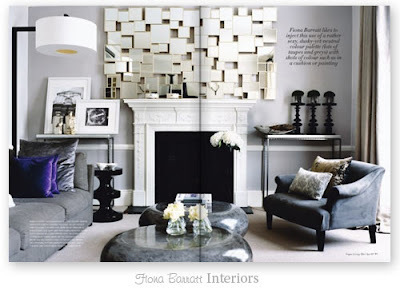 This grey living room also draws me in – it’s very chic and modern but still has a warmth to it. I absolutely love that glamorous mirror above the fire place. (Although I will admit the scale is all wrong with the fireplace – but that is another post) Yes, I would definitely enjoy entertaining friends on a rainy evening in this glamorous living room! 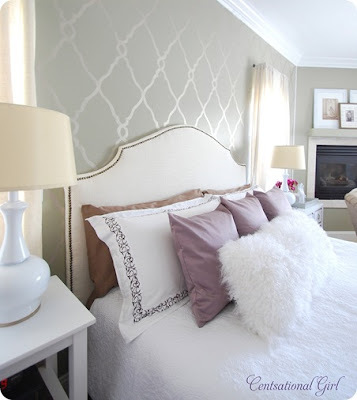 And I adore the grey wallpaper with its metallic sheen in this bedroom - it raises the glam quotient to high alert!! And adding a touch of purple is always so perfect!! Well I can’t make the gloomy days filled with rain go away…..but hopefully I have cheered you up just a little.